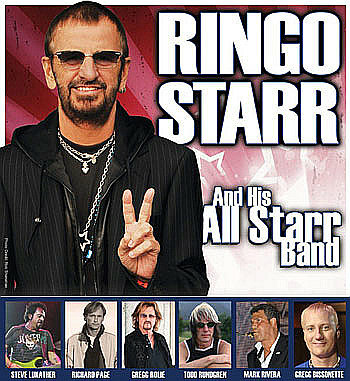 ANNOUNCING RINGO STARR & HIS 13th ALL STARR BAND.. http://RINGOSTARR.jonesbeach.com Featuring Steve Lukather (Toto), Gregg Rolie (Journey, Santana), Richard Page (Mr. Mister), Todd Rundgren, Mark Rivera and Gregg Bissonette.. Today Ringo Starr announced his 13th All Starr Band, which will launch June 14, 2012 from Fallsview Casino in Niagara Falls, Ontario and conclude July 21, 2012 at the Greek Theater in Los Angeles, California. New to the All Starrs are Steve Lukather (Toto) and Gregg Rolie (Santana & Journey) who will join All Starr alumni Richard Page, Todd Rundgren, Mark Rivera, and Gregg Bissonette. The tour is being produced by Dave Hart and as always fans can expect to hear a jukebox worth of hits. Ringo classic’s such as “It Don’t Come Easy”, “Photograph”, “Little Help From My Friends”, “Yellow Submarine” and “Wings", from Starr’s just released 17th solo record, Ringo 2012 (Hip-O/Ume). All Starr’s hits include “Rosanna,” “Broken Wings,” “Hello It’s Me,” “Black Magic Woman.” Ringo will spend his birthday on the road, with a performance at Ryman Auditorium in Nashville on July 7. 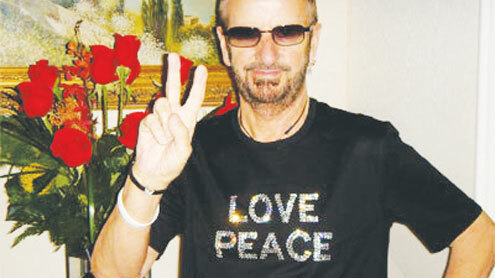 Following in the tradition of the last few years, at Noon from the Hard Rock Nashville, Ringo will ask anyone anywhere, and everyone everywhere, to join him in a wish for Peace & Love.